Being a small, family-minded practice of vets in birmingham, all of the staff working here have a real interest in providing an individual service with empathy and care. You’ll be reassured to know that many of the staff have worked here for over twenty years. Your pet will always be monitored by a qualified veterinary nurse. You may be surprised to learn that this is not always the case at other vets in Birmingham, or elsewhere. We always try to ensure our clients always see their vet of choice, and because we have three vets, this is almost always possible. We feel that this gives you a much greater chance of developing a good, trusting relationship with us, so that we can provide you with the best possible care for your pet. Happy clients = well looked-after pets. All three of our vets have many years of experience in small animal practice, and each has their own special interests and knowledge. One of our vets holds further qualifications in both ophthalmology and surgery. Unlike some other vets in Birmingham, our consultations are by appointment, which means that you will not be left waiting for hours in our waiting room behind lots of other clients. We provide a 24-hour emergency service, staffed by specialist emergency vets, to ensure that your pet will receive round-the-clock care whenever it is needed. 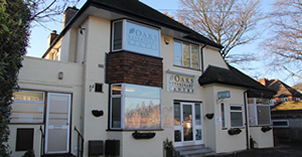 At Oaks Vets in Birmingham, we have separate waiting rooms, and kennel rooms for dogs and cats, to decrease the stress for pets who have to stay in the practice. We can also provide separate kennels for rabbits and small furries. We are one of the few vets in Birmingham that have an isolation room with underfloor heating for infectious or very sick pets, to ensure that they are kept away from other animals and are provided with the best possible care. We attract clients from all over Birmingham, and some come from as far afield as Norfolk and Cheshire. We have customers who use us as their vets in Quinton, Kings Heath, Edgbaston and Harborne, as well as the more obvious Cotteridge and Bournville. Do you keep rabbits? Have you been having trouble finding a rabbit vet? Well, search no more! Rebecca Rowe is our rabbit vet, having had an interest in small furries for the last 30 years, since having hamsters, guinea pigs, rabbits and chinchillas as pets herself. Rebecca has attended courses on rabbit care and disease since she qualified 18 years ago. Her patients travel from as far afield as Norfolk and Cheshire, as well as more locally (Quinton, Edgbaston, Harborne etc). Rebecca routinely neuters male and female rabbits, guinea pigs and even rats! During surgical procedures all our rabbit patients have a tube placed into the trachea during surgery to improve safety and anaesthetic control, and all are monitored constantly by qualified veterinary nurses. Recovery takes place in a quiet area away from other animals, with heated kennels and fresh food to encourage a rapid return to eating. You can even bring your rabbit’s companion for comfort and to maintain bonding. Our rabbit vet can give advice on nutrition, bonding, vaccinations, parasites, dental disease and much more. Vaccinations include a full health check with advice and information sheets.